Construction Mechanics Lien Notice/Waiver Forms for all in the Construction Industry. Pre-LienDepot.com is a Arizona Do-It-Yourself website for the Construction Industry. This is a Nationwide site with States specific construction forms from Notice's to Mechanics Lien to Release's to SATISFACTION. The forms are in compliance with the Statutes for each State and monitored updates if the Statues change. You can purchase a form for $9.95 and do it all on line. 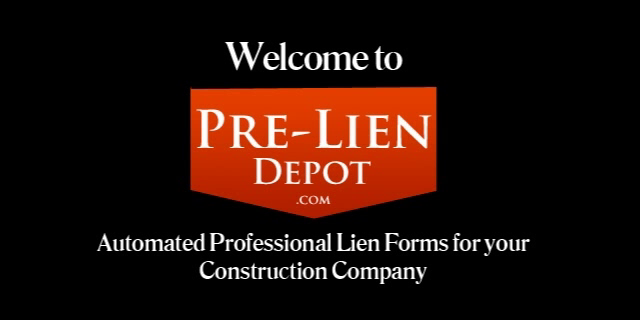 In today's economic times and with the constant changes in the Construction industry, we here at Arizona Pre-LienDepot.com, have created a website that allows yourself or a staff member to create and maintain all the aspects of protecting your lien rights.